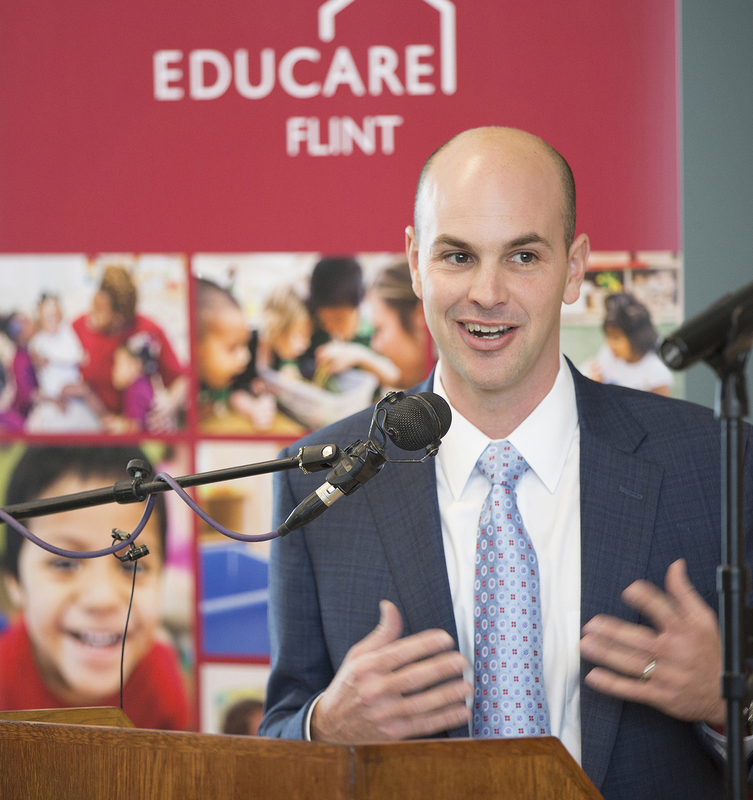 Flint, Michigan — Educare Flint today welcomed — and was welcomed by — community members who took part in an opening celebration for the brand new, state-of-the-art school. Launched in the wake of the Flint water crisis as part of an urgent effort to increase access to early childhood education, the school will serve up to 220 Flint children from birth to age 5 each year. It also will link students, their families and other residents with community-based services. And by offering professional development opportunities to all early learning and child care providers located in Flint, the school will help to strengthen the quality of early care throughout the community. Mott Foundation President Ridgway White delivers remarks at the opening celebration. Educare Flint opened its doors to students on December 4, less than a year after construction began on the almost 36,000-square-foot school. Adopting a “fast track” approach to completing the building while maintaining the highest quality standards was essential to the project, said White. The Mott Foundation provided $11 million in grants to support the construction. That same commitment was reflected in the speed with which program partners worked to bring the national Educare model to Flint, says Cynthia Jackson, senior vice president of the Educare Learning Network. Created by the Buffett Early Childhood Fund and the Ounce of Prevention Fund in 2003, the Network acts, in part, to help its member schools — 23 to date, including Flint — provide children with stimulating, high-quality educational experiences that support success in kindergarten and beyond. A teacher at Educare Flint interacts with her young students. Lisa Hagel is superintendent for the Genesee Intermediate School District, which operates Educare Flint. She said the model’s emphasis on engaging parents and caregivers has long been central to her own views on education. The state of Michigan also is playing a critical role. To help Flint families recover from the water crisis, the state piloted a project to support children’s free participation in high-quality, all-day, all-year early education programs. Other partners who are helping to launch, support or implement the Educare model in Flint include: Flint Community Schools, which sold land — at a cost of $10 — on the campus of its Durant-Tuuri-Mott Elementary School so the new Educare school could be built there; Michigan State University, the Ralph C. Wilson, Jr. Foundation and the University of Michigan–Flint. Partners who helped with construction and financing of the building include Consortium Group, DW Lurvey Construction, Flint Community Schools, Flint Kids Learn, IFF, Local Initiatives Support Corporation, PNC Bank, RDG Planning & Design, and Uptown Reinvestment Corporation. The building is owned by Flint Kids Learn, a supporting organization of the Community Foundation of Greater Flint. Enrollment currently is focused on children who live in Flint now and who also lived in the city during the period of potential lead exposure. Students’ families also must meet income requirements related to the state and federal funding streams that support participation in the program. Enrollment is free for those who qualify. Parents interested in enrolling their child in Educare Flint or another local preschool program should call (810) 591-KIDS.